WhatsApp shows various signs when you send a message. Every mark has different meaning.If your are new, it might be confusing to you to understand the meaning of those check marks. 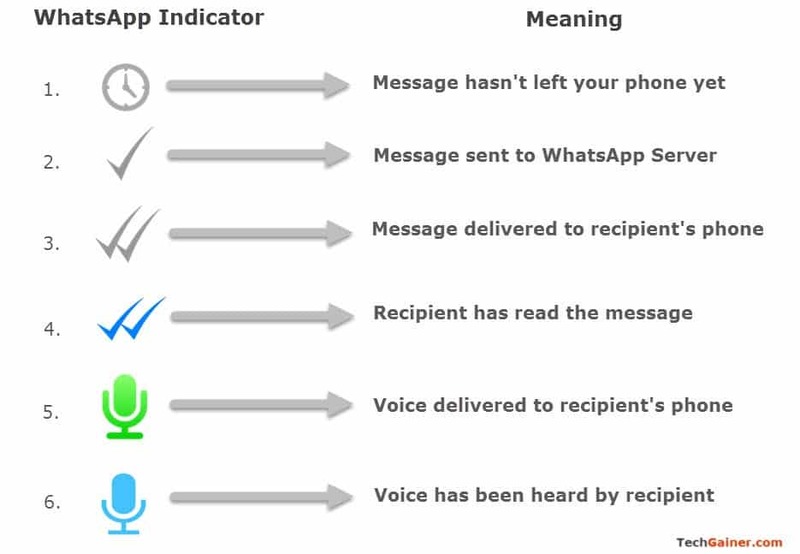 WhatsApp will show different check marks and indicators next to a sent message depending on the message’s status (sent, delivered or read). Gray clock icon says that your message has not left your phone yet. Depending on your interned connection, this icon shouldn’t stick there for more than five seconds. If it’s still there, this means either your phone has no internet connection, or your phone experiencing problem connection to WhatsApp server. Recipient’s phone is switched off. Phone is offline (no internet connection). He/she might have already blocked you. Recipient may not have opened your conversation. Recipient might have disabled Read receipts is WhatsApp’s privacy settings. Recipient might have disabled internet connection (or having connection issues) or switched off the phone since the message has been delivered. Or he/she has an outdated version of WhatsApp. This doesn’t necessarily means that the recipient hasn’t read your message. For example, on Android, a short message can be read from the notification bar without even opening the app. Or someone can easily read your message from desktop if he or she is mirroring Android notifications to desktop. Double blue check mark says the message has been read or opened by the recipient. But if the recipient has disabled Read receipt in privacy settings, you will never see these blue marks. The blue marks also doesn’t necessarily means he or she did read your message. Because they might leave the phone having the WhatsApp open. WhatsApp also lets you know the time when a message has been delivered and when it was seen/read. To know it, simply tap and hold on the message and choose Info button or icon, depending on Android or iOS. It will then show you the timestamps of the message’s status. Official FAQ has more details on message info. Note that the web version of WhatsApp (web.whatsapp.com) doesn’t have this feature yet (at the time of writing this article). By all these means, you shouldn’t have trouble understanding a message’s status in WhatsApp, unless you are blocked by the recipient. As said earlier, the gray single tick mark will persist if you sent a message to someone who already blocked you.